... never have I seen such an equation! It was great fun to watch these two guys (right arm of the other painter - resting or bored, presumably - is at lower left) hand-painting this billboard, slowly and in real time, over a parking lot at the corner of Crosby and Broome in Soho. It's not so common to see billboard painters these days, especially in a get-up like that one - suspenders and hat! 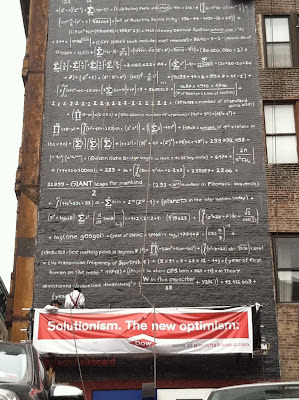 And it's not just an ad using the idea of a complex mathematical equation, as I thought when I watched it being written up there. It's in fact an actual formula with a "solution." See this link for a better look at the problem, the solutions to the various component parts and the overall solution itself. Very clever. I love the idea of using math and historical events like that to scratch the brain. Another "Ah, New York!" moment.